War is something that is unimaginable to someone who’s never seen combat. Soldiers all over the world are haunted with the images burned into their minds and sleepless nights that are endured by violent nightmares. War is something that needs to be talked about and never forgotten. Of all the war movies I’ve seen, there is nothing like Spielberg’s Saving Private Ryan, one of the most gritty, brutal and scary films I’ve ever seen. Spielberg and his team crafted a grim look at World War II and have told a story unlike any other war movie that came before it. With the exception of Full Metal Jacket and Platoon, Saving Private Ryan brought the war to us and wasn’t shy about what the soldiers went through. It’s here that we look back and remember what Spielberg gave us twenty years ago. The one scene that everyone will remember from this film is the opening twenty-seven-minute Omaha beach landing scene during the Invasion of Normandy. American Soldiers are massacred without stepping off the boat ramp and young men are seeing hiding wherever they can from the gunfire by the German MG-42s in the bunkers overlooking the beach. Personally, after this intense opening, I feel that the movie should break for an intermission because emotions can run high. It’s overwhelming especially if you have family members who were there that day. My grandfather was. It’d been a couple of years since I watched Private Ryan all the way through and when I did I broke out into tears on multiple occasions. This isn’t a War movie that I think is entertaining, but really are there War films that are entertaining? I suppose to some people that can be true but for myself, Private Ryan talks about issues that the soldiers face and how they deal with them. Imagine seeing a friend of yours getting shot multiple times or holding somebody when they are facing death knowing that they will not make it? Those ideas hold gravity and it hit me like a ton of bricks. Spielberg has created something truly unique and bold, (when it was released in 1998) a war film that captures what war is and doesn’t follow a typical Hollywood movie. Remember those John Wayne movies where it appeared that war was glorified? “Follow me!” John Wayne would shout. In Private Ryan, it’s a much different story. One of the things that makes this film special is how the men react when they get orders to find a young man behind enemy lines and are to send him home. This man, only known as “Ryan,” has a ticket home when it’s learned that his three other brothers were killed in combat, leaving him as the only son left alive. In usual cases, the men would be ready to find this man and get him home. Do the heroic thing. Not in this movie, the men ask, “why?” This is evident in the film’s tagline: “In the Last Great Invasion of the Last Great War, The Greatest Danger for Eight Men was Saving…One.” It’s a risky thing to send eight men behind enemy lines to find one guy. That’s the objective and most of the men in Captain Miller’s (Tom Hanks) Company aren’t pleased with the orders. They survived a living hell at Omaha beach and now are faced with an even far more dangerous task. I don’t want to focus too much on the characters in the film but I do want to mention Captain Miller. A man with a few mysteries, little words and someone who has a mission of his own. Tom Hanks is already such a great actor and it’s here in Private Ryan where his skills are utilized in the best way. I love how the soldiers in the movie don’t express much about their lives, only when they feel the need to. This isn’t a movie where a bunch of soldiers are sitting around a campfire or barracks talking about their lives. They are trying to survive war. Captain Miller has seen his fair share of combat and horror and we get a sense of this when he talks about how many men he’s lost under his command. He believes that he’s saved more than he’s lost, but it’s his facial expression that says it all. Even when he finally meets Ryan (Matt Damon) he mentions briefly what he remembers most about being home. He mentions it but doesn’t talk about it. That’s a memory for himself. He’s a good Captain who leads his men on a journey that’s filled with loss, horror and the hope he can complete his mission in the hope that he can return home to his wife. It’s poignant, brave and represents a character that feels believable. Another character I want to mention is that of Corporal Upham (Jeremy Davies). He’s the most interesting character of the whole bunch because of the actions and decisions that he makes. He’s never fired his weapon in combat and is essential to the Company as he can speak French and German. He’s terrified of what’s happening around him and this makes him out to be a coward as said by some of my friends. I first watched Private Ryan back in High School and most people singled out his character because they felt that he was a coward. Personally, I don’t know how I’d react if I was in a war-like situation, me having to decide if I’m capable of killing someone else. Someone I don’t know, have no argument with and have never met in my life until that moment. This has to be a horrifying thought to run across anyone’s mind. It’s a decision that no one should ever have to go through. The supporting cast that makes of the remainder of the Company includes Tom Sizemore, Edward Burns, Vin Diesel, Barry Pepper, Giovanni Ribisi and Adam Goldberg. Every one of these actors do excellent work here making their characters memorable and worth seeing again. I did say before that Private Ryan isn’t entertaining in my eyes but is more of a film that you should see to appreciate the people who served in WWII. Beside the Omaha beach landing being something I’ll never forget other scenes include Medic Wade’s death, Captain Miller in the church conversing with Sergeant Horvath and the last-stand effort of Private Jackson. It’s unique to see Private Jackson fire his sniper rifle with his left hand and cycle the chamber with the left as well even though it’s meant for a right-handed individual. The film itself is based on the Niland brothers’ story, but as Spielberg and his team interviewed more and more people it was realized that more families lost brothers, sons and fathers as well. The idea to find one brother when all of his have been lost is a mission worth fighting for. The toll a mother would have wash over her when the Army comes to bring her an American Flag at the news of her son’s death brings me to tears just thinking about it. Spielberg achieved something that no one dared to do in the first place, capture war the way it really was. Savage, brutal and unforgiving. 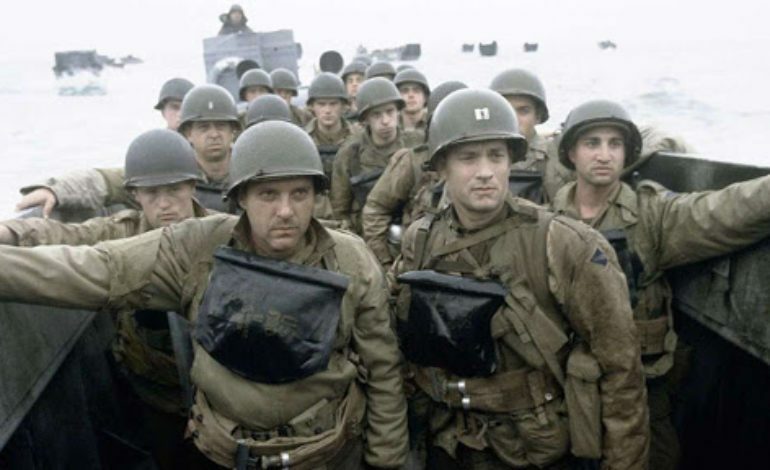 Saving Private Ryan has been often cited as, “the most realistic war movie ever made,” and here are some examples to think about. The battle scenes are chaotic and extremely violent. The picture has a desaturated color that is reminiscent of magazine photography of the war. The camera shakes violently and even the editing is done in the same way making us, the audience, feel as if we are there with the soldiers. Being as close to ground is a key to saving your life and your helmet will protect you. Even the moment when Captain Miller is yelling at Private Caparzo to return a child to her family because we have to follow orders and we aren’t here to do the decent thing speaks tremendous volume. Saving Private Ryan is a war film with ideas instead of a spectacle to make war look cool. There are no cool shots or moments when the characters do something awesome, this movie is a representation of war and not some action movie. In my opinion, Saving Private Ryan is the only war film I’ve seen that affected me the way that it did. It reminded me of my grandfather who stormed the beaches of Normandy, but I was too young to talk to him about it when he was still alive. I cried so many times because the emotional level rings true in every scene. The scariest part for me is when the ramp opens on the boat and that first shot is heard, that sound will never go away. I can’t imagine what these brave men went through but Saving Private Ryan paints a picture that is close enough to put you on the front lines.